A friend of mine came over last weekend with her little girl. She is 5 and loves sweets…who doesn’t! I wanted her to have a good time without raising her blood sugar too much. Kids have lots of energy and no need for extra artificial sugar. I’m sure all moms can use a little peace and quiet once in a while. My friend is a working mom and hardly has any time for herself so I thought a couple of healthy but tasty snacks should do the job. There was a big piece of dark chocolate sitting in my fridge and it made me think of frozen chocolate covered melon sticks and chocolate with dried fruits. Mission accomplished! Cut the water melon in any shape you like and insert a craft stick into each piece. Place on a tray, cover with plastic wrap and place in the freezer until frozen, about 2 to 3 hours. Place the grated coconut in a shallow dish or on a plate. Melt the chocolate in the top of a double boiler over slightly simmering water, over the lowest possible heat, stirring frequently. Make sure the water is not touching the bottom of the top pan. Pour the melted chocolate into a tall glass. 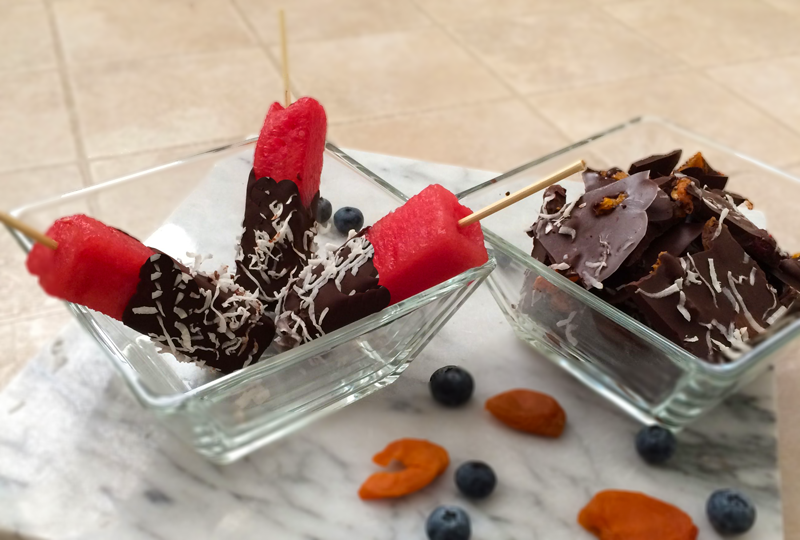 Dip each frozen melon stick into the chocolate, turning it to coat, and immediately roll in the grated coconut. Place on a tray covered in waxed paper. Serve immediately. On a sheet pan place some parchment paper. Pour the remaining of the melted chocolate onto the parchment paper and spread it lightly and evenly with a spatula. Sprinkle the top evenly with the dried fruits. Press the fruits slightly with your hands into the chocolate. Cool in the fridge for about 30 minutes. Peel of parchment paper and brake into pieces. This entry was posted in Desserts, Food, Gluten Free, Health, Life, Recipes, Sweets, Uncategorized and tagged Children, Chocolate, dark chocolate, Dried Fruits, Friendship, Frozen Fruit Sticks, grated coconut, melted chocolate, Natural Frozen Bars, Water Melon. Bookmark the permalink.